When Nichole issued this challenge to the Papertrey Ink senior DT I felt a little blank. That boot from Papertrey Ink's Green Thumb set is stinkin' adorable but Ive played a ton with it and was worried I had exhausted all my ideas. 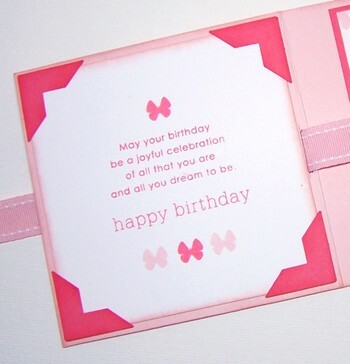 The next morning I woke up with a card formed in my imagination...I was elated! I had paged through an issue of Papercrafts... a bunch of issues actually so I can't recall the specific one...when I ran across a super cute bag that Nichole had done that was inspired by a froggy rain boot. Ella has the Ladybug version and it didn't even click until my brain had a rest that I could use the boot and some google eyes to create a Ladybug Rain Boot card! Here is the finished card. I stamped the boot with red ink then trimmed it out. I then used black stickles to cover the white dots and the other black parts of the boot. It's not showing up a ton...but this sweet boot has sparkle! The puddle was created by punching out a post it note with the larger oval punch from SU! then using the negative side as a mask while sponging on the inside with a light blue. I gently applied stardust stickles to give it an extra sparkle touch. I would have used Waterfall stickles instead but I ran out... if you make this card use that instead ...it would look so much better. 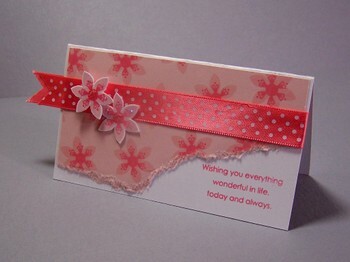 I'm going to show things a little backward for today's post and show the outside of the finished card first. I wanted to make the outside attractive but not be the "big show" of the card. 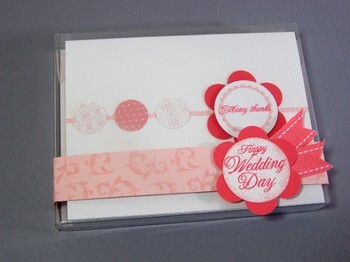 Wedding Day is a great stamp set and had some really sweet smaller images that make it easy to create elegant anytime cards. (I also like that it has all the month's and numbers so I can use it for scrapbooking.) The Berry Sorbet panel is repetitively stamped with the same image I used as the background for the butterfly (upper left corner)...to tie the two elements together. The bow is tied traditionally instead of a knot... to entice my daughter to take a peek...an easy to open option compared to my normal "tight as can be" knot.
. The inside is where I wanted the surprise to happen for her. 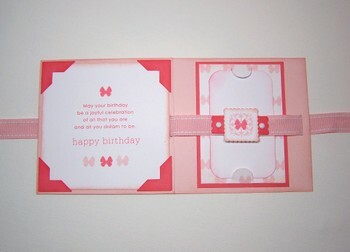 I combined sentiments from the Birthday Basics set and carried over the butterfly image from the front. Next I created the panel that holds the gift card, using SU! 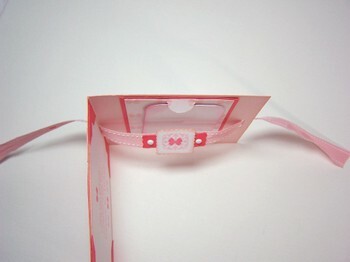 's slit punch, and slid it under the ribbon to adhere to the inside of the card. 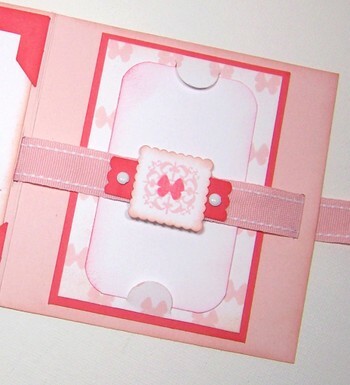 I then decorated that section of the ribbon to give that side of the card a decorative element. All Supplies by Papertrey Ink unless otherwise noted. Other- yellow scalloped square, Blue scalloped rectangle, Corner Rounder punches (Marvy); Slit Punch, Corner Punch (SU!) Making Memories ribbon punch. I'm so glad Papercrafts lets us share some of what we get published with them! It makes it even more exciting when an issue comes out. I was really excited to get this particular issue too. I've had to pull way back from the amount of time I spend on creating for submissions. The call for this issue stumped me a little but on the last day, inspiration struck... like lightning! I was so grateful! The call was for creating Mother's day jewelry. Both things are hard seperatly for me. LOL! 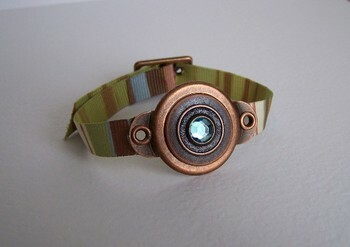 This is a bracelet concept I concocted using some of my favorite WeR products. (See this issue for a full list of supplies and instructions) I was...at the very least...giddy that I figured it out and that it came together so well..and are easy to recreate! I was asked to create an additional card and box to accompany it as well and they really did a great job showcasing it all! Alex (my DD) made several of these for Christmas presents this year...and they all turned out uniquely beautiful! Ohhh... and make sure to check out Taylor's awesome stationary box. It blew my mind! Have a fantastic and Blessed Easter! I had a blast creating for this months Papertrey Ink samples! The new colors... the new paper... the NEW STAMPS!!! *sigh* Lovely...that's the word that describes it all to me! So I wanted to share some thoughts about my projects. I've come to the realization that my style has changed over the last few years. (not sure if that's good or bad though.).. I used to create in such detail for EVERYTHING... now I start as simple as possible....in search for the simple WOW. Only you can say whether I achieve it or not though. ;) Ive been really trying to think practially... as in what I would really make and give. I tend to be that person that forgets until the last minute that we have a wedding reception to attend...or one of my girls have a birthday party to go to...then am rushing at the last minute to try to create something with a little WOW to give to the recipient. One of my favorite things to give are Thank You Notes. I have found that I need them in a pinch...and much to my horror...I have NO local friends that stamp or create... So I think these are a handy gift. Whenever I've hosted a baby or bridal shower I always give the shower recipient a little pack. Here is one I created for a wedding...and it's nice to have it ready to go now! 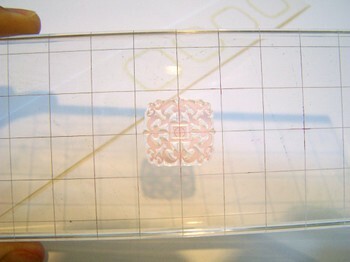 I thought I would be smart and use Papertrey's clear boxes as the container as the actual "gift Wrap". I've made several using these now and they are great! I made the card first...with a few things in mind. I wanted it to mail flat so that it wasn't a fortune to send out...so you will notice a severe simplicity. Apparently it can cost a pretty penny if it's over a very small thickness. This band was created to "mask" the cards so that the case could be affective as gift wrap. Here is the finished ensemble. Now... not something that you would gasp over but functional and real. Oh...did I mention that I used Papertrey's note card and envelopes too boot? Yep.... makes it even easier when you have those ready to start! Here is a card using that same Wedding set "Wedding Day" that could be used as an actual Wedding announcement or even a wedding wishes card. Imagine making 250 of these.... not such a horrible task when it's simple layer and ink! 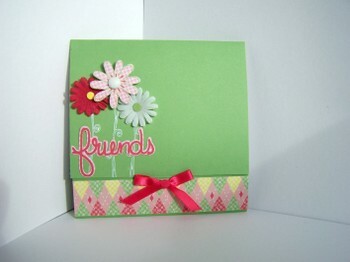 Now... this was the first card I made when I received my DT stamps. I wanted to try out these cupcakes and the new colors of course! (Love them SO much) I added stickles to the sprinkles to give it some glitz. 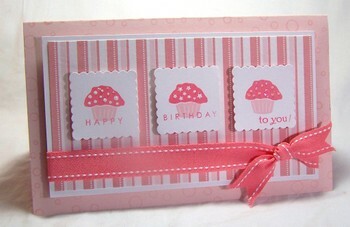 "It's a Celebration" is on of those set that shows up even better (Translates well) when stamped!
. The new "Simple Alphabet" really made it easy to customize. 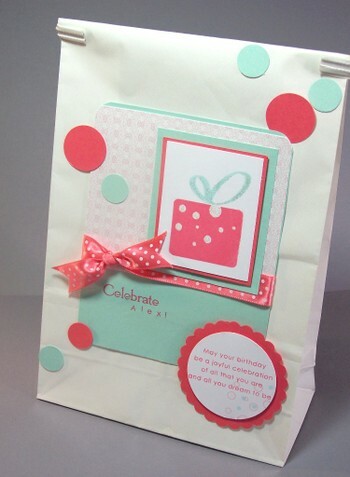 Another simple...but elegant card using "Boxes, bags and Tags" and "Birthday Basics". I thought this would make a quick and easy wedding day card too. I can't tell you how much I love the two new colors (Berry Sorbet and Sweet Blush) together! And finally... you likely spied this over on Nichole's blog but here it is one more time... 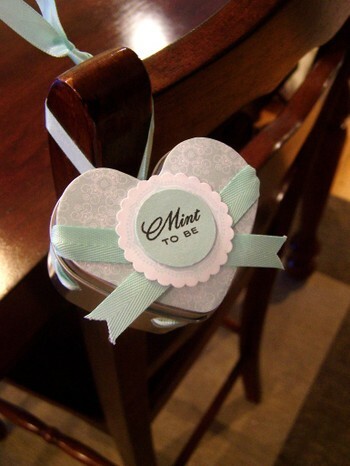 Imagine a whole room decorated with these hanging off every chair full of yummy mints. Thanks for stopping by! By now many of you have ordered from Papertrey's new release. I would love to know what you got! Have you ever gotten a gift for someone and just couldn't wait for them to open it? That's how I feel every month when I get my Papertrey Ink Stamps and create my DT samples...and now that the PTI team has added Cardstock, Ink, Ribbon and Pattern paper... I usually feel like I'm going to burst from the excitement waiting to share! This is why I'm SO excited to share a sneak peek with you today! I thought it would be fun to share with you how easy and pretty it is to stamp on Paper trey's Topnotch Twill! I usually create by starting with a focal image... then let that determine what embellishments I use. 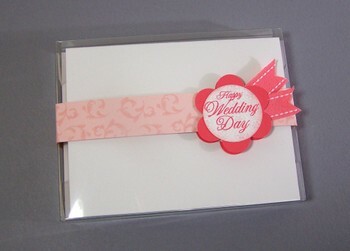 I wanted to create a Wedding day style card (that can be used for any type of love occasion.) using Alli Miles awesome new wedding set! I'm really loving her sets! 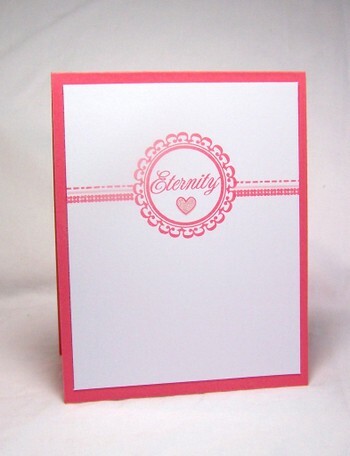 I wanted to keep this card simple but give it an elegant flare... something I could create in a snap. I started with this fun little frame image that I was able to perfectly line up on my grid acrylic block. I then stamped 4 images side by side making sure they were evenly placed in the middle of the white cardstock strip. I trimmed the strip to meet the width of the card. You will notice that I didn't take the image off the sides. I wanted to add the the framed feel...and you will see how that turned out in the final photo. I love how perfectly square this image is... It was beyond easy to square it in the middle of the grid on the dot in the center.... then fill in the frame with this crest image...not sure if that's what it is... but that's what I'm callin' it! :) It's always a fun experiment to see what images can fit together...and now that I'm designing my own stamps it makes me wonder if its planned or sheer chance. I know that I have planned some... but some seem to fit together by chance....after the fact. Oooops... sorry... back to the card at hand! 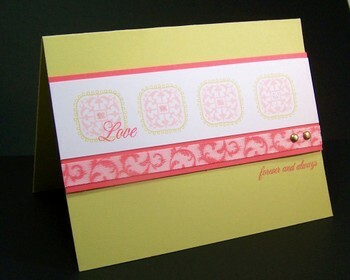 I wanted to add an additional elegant element by stamping the lovely petite flourish images on the Sweet Blush Twill using Berry Sorbet ink. This is a snap because I placed the images side by side and stamped both at once! total time saver. I layered the finished white strip and the stamped twill onto a strip of Berry Sorbet cardstock, then trimmed the twill to size. this allowed the twill to keep straight while I trimmed it. I added brads to the panel next. I'm not a huge gold person... but brushed gold is extremely hot for weddings right now. Here is the finished card! (click on it to see a larger view) I used the "Love" and "Forever and always" sentiments from Alli's wedding set and added stickles in the center square of each image on the panel to give it a simple glistening jewel effect. The focal panel is mounted with thin foam mount tape to add dimension. I LOVE what the stamped twill does for this card. 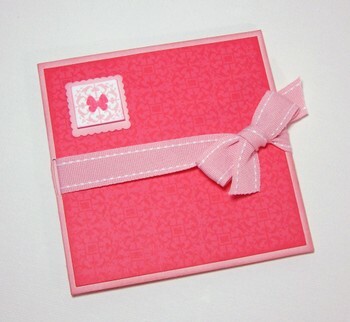 It's elegance is the perfect touch to make this card feel refined to me! A few months ago I was contacted by the Creative team over at CardMaker. They were putting together Card Kits full of snazzy supplies and asked if I would design the cards with instructions for the kit.. I was just giddy and jumped aboard! It's always exciting to dive into a new design arena. I thought the kit was fresh and fun and I even had things leftover when I was finished...which is always a plus. 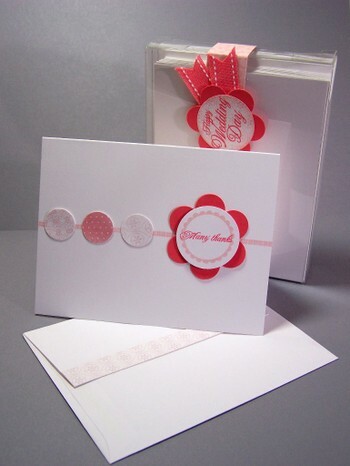 If I would have added white cardstock to what I used I would have been able to make a min. of 12 cards....maybe even 15! 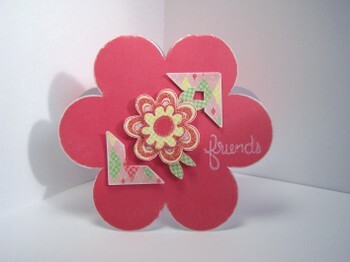 And who doesn't love flower shaped cards? One fun thing that I learned how to do during the creation process was to adhere colored stickers to cardstock then sand the edges and lightly sand the top layer. this removes the glare and softens the edges. It really opened up, to me, new possibilities for product usage since I'm not a huge sticker lover. If you're interested in creating these cards..and their companions...you can call CardMaker's Kit of the Month Club at 1-800-682-6643 and they can get you started. (this is a really new program and they don't have a web link yet or I would have just linked over) I know that they have done a kit with an embossing template as well as other what I call re-usable supplies. UPS usually rings my door at about dinner time here in Anacortes. Last night I was sitting here eating my ginger chicken (yum) when the doorbell rang and two packages came. *happy dance! * One had my complementary copies of Home & Heart were in one box. I was so excited! It's a great issue and the first time I have been in it. Actually it's only it's 2nd issue but was called Home Grown Hospitality before. This is a beyond crafting magazine... and it may become a favorite! I was lucky enough to have 2 large ensembles picked up for this issue. I'm allowed to share a little...so I thought I would share one of my favorite things! This is the photo I used for submission. The call was for Parties... and I suggested that I as some components upon acceptance. You will find those additional components in this issue.... a yard sign, cup wraps, silverware wrap & gift bag. I think it all came together nicely. Simple and recreatable... which is what you need for a baby shower! 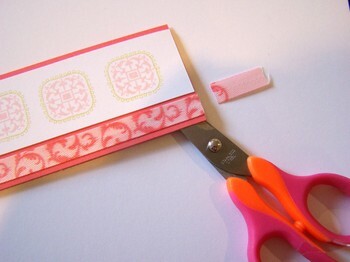 (please see the issue for the supply list/instructions) Aren't those Papertrey stamps the funnest! 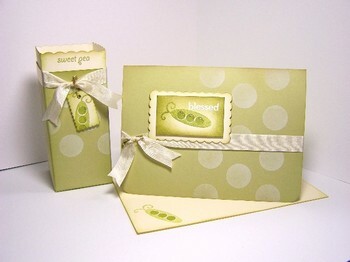 I just love that pea pod! The layout in the magazine is really fun and shows the projects in "action"! speaking of Papertrey... did you see Debbie's cute list book!? So cool! Now... I keep hearing about google reading and it's messing my, as well as other blogger's, pages up. Thanks for letting me know...Not sure I can do much about it.... Here is my best suggestion though... remove my blog from the reader ...then re-enter it using the domain name.... you see... I purchased it a long time ago... so this might help. www.poppypaperie.com maybe by leaving typepad out of the equation it will work better. HTH. ETA: Thanks for pointing out the bad typo *blush* ...yikes doesn't even cover it! I also wanted to add some exciting news about Home & Heart Magazine! Last Saturday I was in bed with my ...er... Nemesis so to speak. (ruptured cyst) Well, I was a little sad (as you may have read) that I didn't have time to execute some ideas for a call for submissions that Home & Heart had put out..and the deadline was Sunday. I was laying in bed...doing what I was told...resting...taking that big pain killer....and watching movies. I had a few things from before that I submitted already...but had these really heart warming concepts. I decided to email them the concepts anyway...even without being executed. I was elated to receive an acceptance from Home & Heart today saying that they wanted many of those concepts. They are familiar with my work (Since Ive been working with Papercrafts for a few years now with submissions) and I must have given them a strong enough description of the concept! What a huge blessing this is! Someone above was lending a huge hand on this for sure! Speaking of cards... here is a card I created for CardMaker's 10 minute cards! e-patternscentral.com has it listed here! 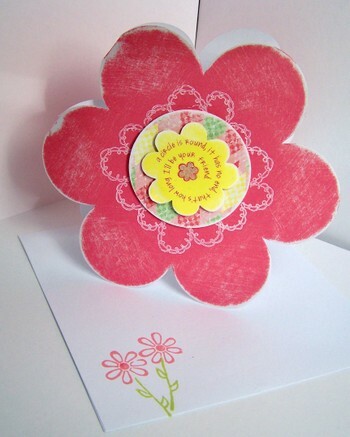 Also... a Mother's day card here that was bumped over from CardMaker magazine! Both use SU images...and both have fond memories of my days as a SU! demonstrator. Check um out...and check out some of the other projects on the site. I'm usually one that likes to look at photos and not read any patterns...but they might be useful for you. I'm not into knitting...yet...but his looks so neat! Thank you again for your thoughts...prayers...and well wishes! You amaze me! Friday night I came home and all of a sudden I was bent over in pain. I had suspected already that I had a cyst a week or so before...I was a little sore...but not bad. This was the kind of pain that makes you want to throw up. I literally rolled up into a ball and insisted that I didn't need a Doc. Chris had to carry me up to bed. When Sat morning came and I had been up most of the night in pain...it was time to go in. I had honestly never had one this painful before. I went in and had an ulrtasound...and it was confirmed... a really big cyst (think of the size of a plum or baby orange) ...with a ton of bleeding out into my abdomen. The bleeding is what is causing the intense pain. I've been put on bed rest...with some heavier pain meds for a few days...hopfully by Tuesday I will be back to my bouncy self. I'm really sad that they are back...it's been several years since I've had a Hemorrhagic one, usually they come, hurt then resolve after a few months of some pain. These bleeding types are SO painful and can cause some serious complications. You have to get an ultrasound to make sure everything will be OK. Well... they think everything will be. I've had a blood test to see if it's something else, but am confident it's not. I opted for a new pill (instead of surgery) that will help in the future. I really do wish I didn't need the chemicals that those ovaries produce, if I didn't I would yank those babies outta there! I feel really blessed that I was able to have my 4 daughters...this condition can really effect that ability. I hope you don't mind me being so open. I know that who we are, what we live through and what we create are all intertwined. We develop sympathy and empathy. We feel joy and sorrow. We become creative spirits in spit of and maybe even because of the trials we go through....we learn how to make lemons from lemonade. Everyday duties and deadlines passed by as I sat here in bed, there was nothing I could do but let it go....yet the important things remained...my family! Thanks to them, with all my love, for taking care of me with such caring compassion. I won't even remember a year from now those deadlines I missed...but I will remember their service to me! I have to admit... I love creating with clear things... I love how ink plays differently with it. 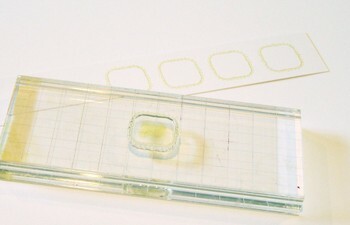 I love how it adds an almost obtuse dimension to a project...Clear products remind me of a fresh snowfall. Crisp and Clean...and fun to play in! Needless to say I was excited when Nichole challenged the Papertrey Ink Senior Design Team to a Clear Challenge! It was an exciting time I tell ya! My Papertrey Patterned Paper was whistling to me for a little play time too...and once I started cutting the ideas started to flow! I made several projects so it was hard for me to decide which one to share with you today. I thought I would share the one that was the most "different". I think I stamp a little differently than most people. I usually start with NO concept or sketch. I start messing around with an element or focal point then build the concept as I go...as my mood dictates. 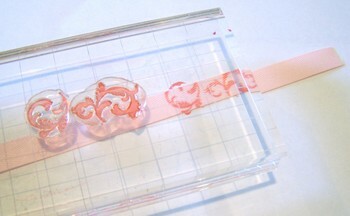 (as you can imagine, good moods are essential to stamping for me!) I started with the clear button in this case. the first thing I did was to sponge it with Spring Moss Perfect Match ink. (then heat set) Next I looked for an image I wanted to stamp onto it. This Thank You was really perfect because it has a little space between the words so It was easy to ink one word separately to stamp, then the other to finish. (StazOn is my ink of choice when ever I'm working on a slick surface and need a crisp image.) So here I was with a ready element and I spied Shapes by Design sitting on my desk. There is an Elegant Funkiness to this set and it was perfect for what I was "feeling" in that moment. 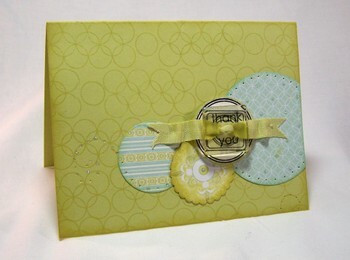 I stamped the Circle combo image and sponged the edges. then I put the button over it to see what it would look like. "Hmmmm.... squares and circles together look kinda cool" I thought to myself. So that's when the plan came together. I punched out the circles and sponged all the edges. Glitter is a must in my book and so Stardust stickles are always within reach. I added little drops here and there for an elegant touch. I'm also a big fan of warping my ribbon or twill. 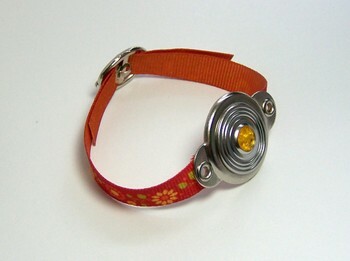 I use Fabri-tac or Zip Dry paper glue from Beacon Adhesives as my adhesives for the. I simply put some on the bottom of the twill then hold it into place while it dries. Lastly I added some paper piercing...it's not showing up great in the photo but really adds to the overall feel of the card in person. I hope you will take the time to check out the other participants in todays Challange...You won't be disappointed!